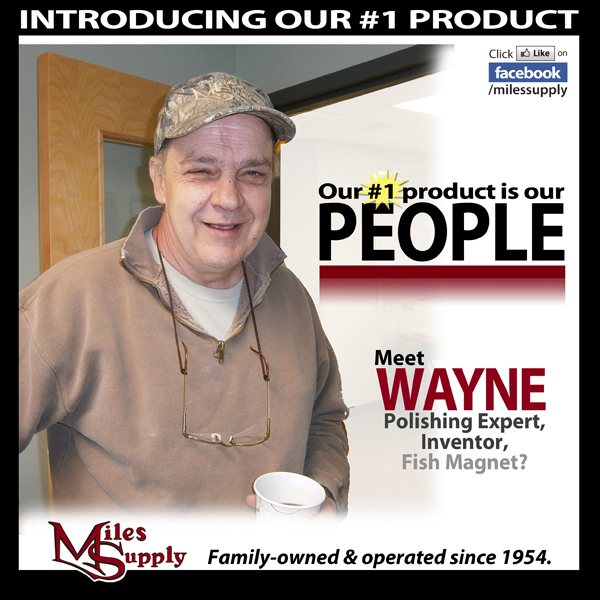 Wayne has been with Miles Supply for over 30 years. He is one of our polishing experts and the PadHead™ polishing & grinding head is his first patent. He's been refining, adapting, and customizing the head according to customers' needs. He knows everything there is to know about polishing - give him a call to stump him! He's a Fish Magnet, or rather, that's his boat's name. A man of many talents; his guitar is the audio in some of the PadHead™ videos. Meet Wayne. 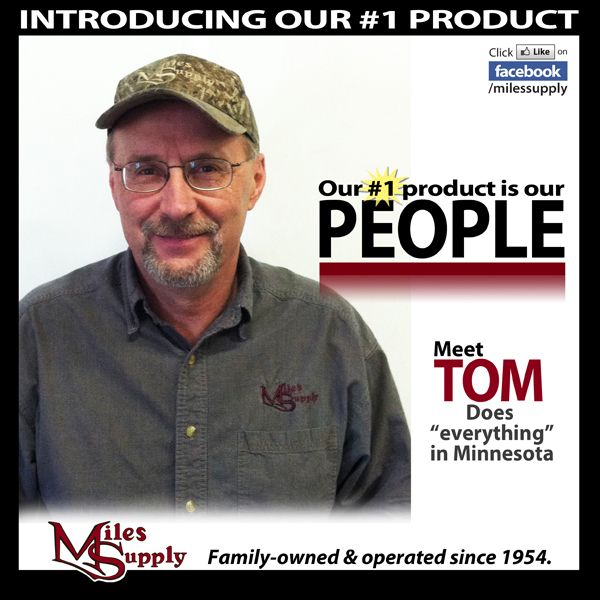 Tom has been doing 'everything' at our location in MN! He has been with us for over 13 years! Customers have told us that the other companies who sell merchandise don't get to know them like Tom does. He prides himself on going the extra mile; sometimes literally! We're sure you'll enjoy getting to know him, too. Monty is our Safety Guru. In addition to sales, he performs onsite chain inspections, First Aid Cabinet Management, Mask Fit-Testing service and VMI (Vendor Managed Inventory Service). This means he manages and re-stocks your predetermined inventory. He's the guy to call for PPE (personal protective equipment) or as we call it, safety equipment. We got him inspecting chains on this video. Monty at a VMHA show. Jamie is one of our Diamond guys in the Barre location. We tip blades in Barre, Elberton, Montrose, Rockville, and Terrell or can come to customers' locations to service the blade. Here he is tipping a blade with his buddy Dave - see video. He makes safety glasses look cool! He Delivers! Kevin is seldom without a smile and is quick to lend a helping hand or a muscle or two. People appreciate his help and accommodation in rectifying any ordering slip-ups. 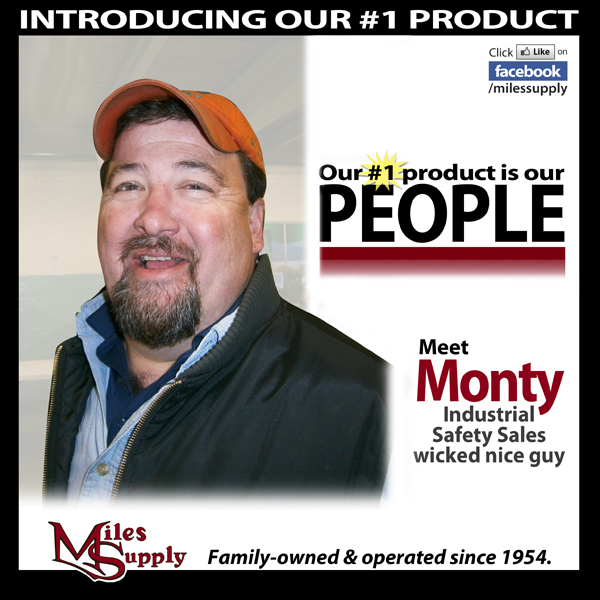 Good qualities to have in a warehouse/delivery guy at Miles Supply. He serves our customers in the Barre location. His other shirt is a cape! Eric, Machine Sales, trained in Italy with Pellegrini and is knowledgeable on all our equipment and machinery. He recorded some of the work that goes into our Shows; see booth set-up. Here he is testing a vacuum lifter; see video. He wins the award for neatest office. Meet Eric. Ronnie was born on the 4th of July and he restores antique cars - you can ask him about it. But most of all you can ask him about SandBlasting, his expertise. As our Sandblast Pro (and dust collection/curtains) he's been at Shows and has done installations "everywhere". Have you met him? Miles Supply has been happy to have him since '98. He's all thumbs up about the SandHandler! Here's a throw back pic of Ronnie. Did you know Miles Supply's JP is literally "our JP"? 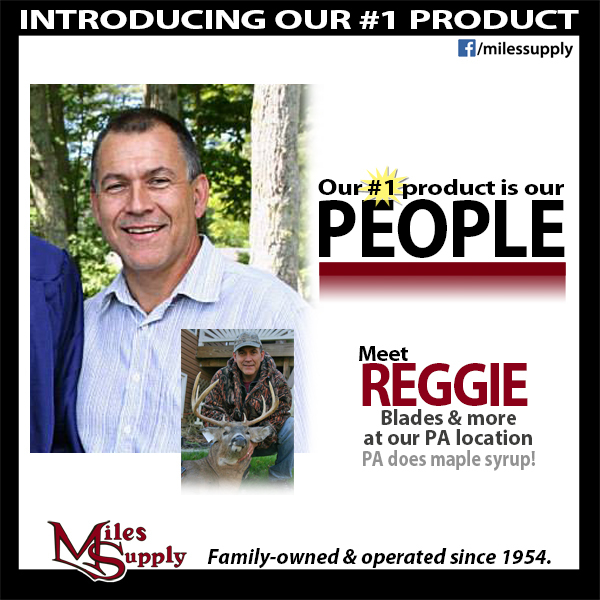 Long ago, Miles Supply named Jeffry this when there was another Jeff working here (we now have another Geoff in TX but he is not part of this story!) 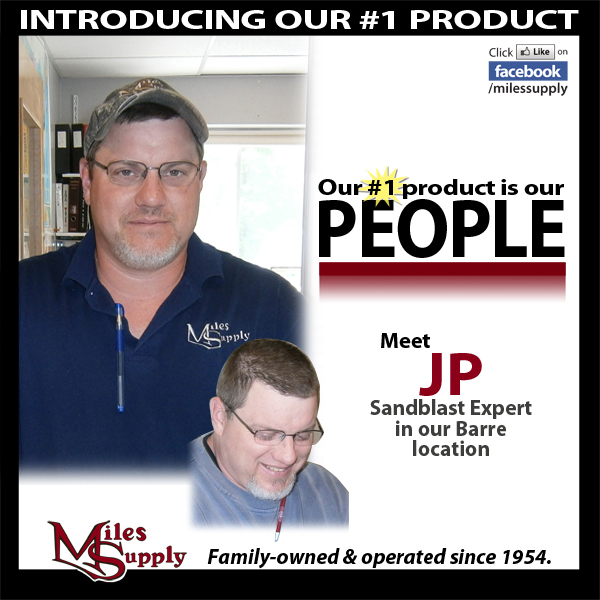 JP is Barre's sandblast expert. 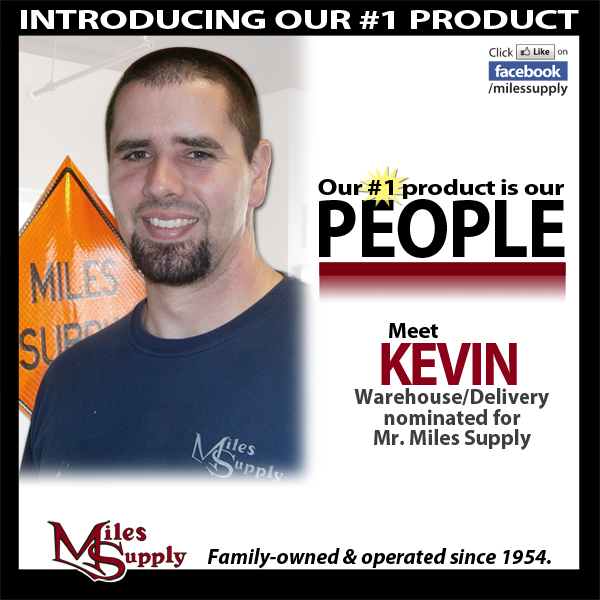 He's been with Miles Supply for over 25 years! See Geoff & Jeff at a show. JP after SandHandler install. And of course Young JP at a show. One more throw back pic. Meet JP. There's just nothing more to say about humble Hank, except our new building in Terrell TX is now open for business! Terrell is just east of Dallas. He works in the 2-man shop with Geoff. See Facebook post. Alex is an all around nice guy and always helpful. 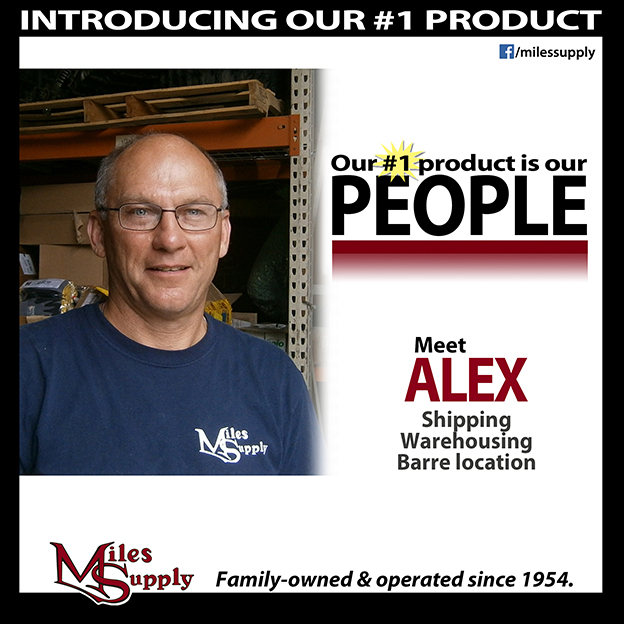 We're happy to have him in the shipping department in Barre. 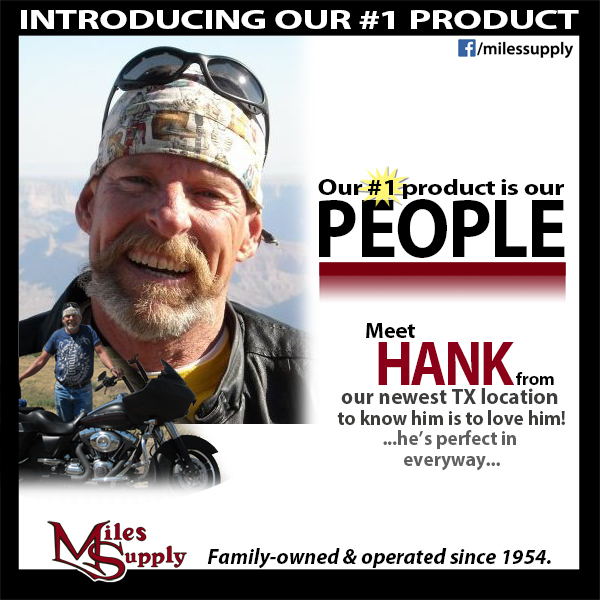 Thanks for keeping him busy and buying from Miles Supply! Meet Alex. Evan is a Jack-of-all-Trades in the Barre location. You have probably talked to him over the phone. He, along with JP, have also been to many SandBlast shows. You would also likely see him first while visiting our Barre showroom. He's a very helpful guy! Throw back picture. Jim Heath is general manager of all things Diamond. 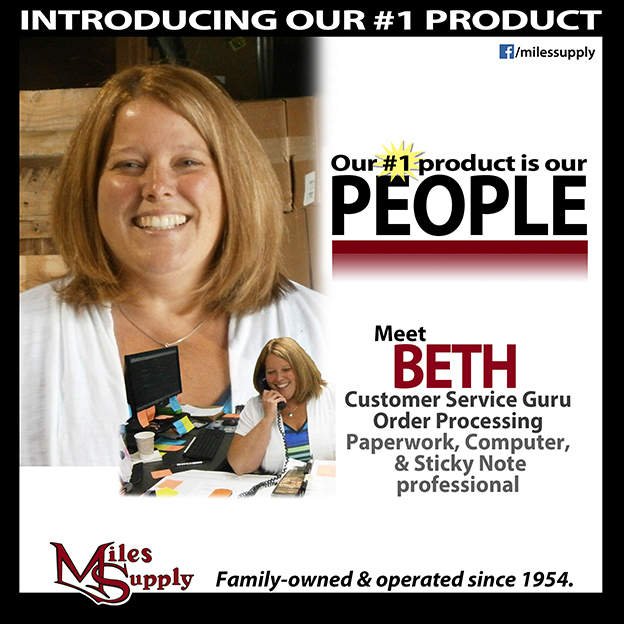 Over 28 years with Miles Supply! 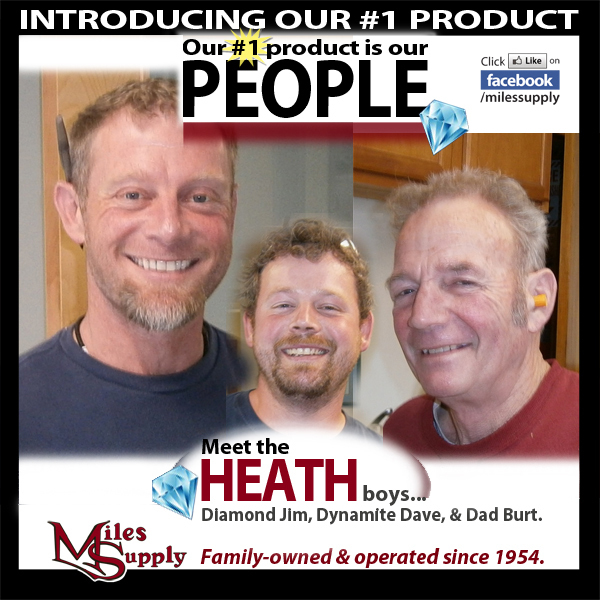 His brother Dave and father Burt who tip blades, complete this family Diamond Team. Of course Jamie is part of the Barre Diamond team, too. Burt stands behind our blades. See Facebook post on these young ones! and Young David again. Frank's #TBT throw back picture. Reggie posts great pictures on his Facebook page... Last year, we enjoyed seeing his trip with his family out West (a photo was featured in our 2018 calendar for March). We always know when he starts boiling sap! Meet Jo Ann. She has worked for many years in our Barre office. Among many duties, she processes credit applications and the mail. Meet Beth. You have probably talked with Beth on the phone. In addition to answering the phone, and many office duties, she processes orders in our Barre location and website. If there's a problem with your credit card, you've heard her helpful voice ready to fix the issue. 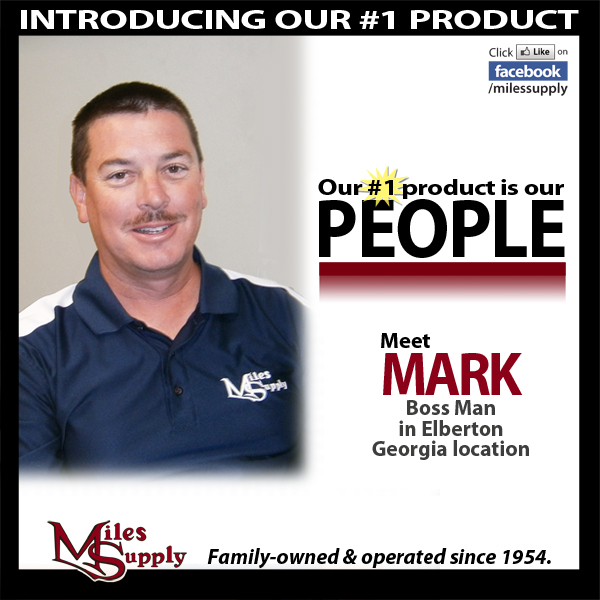 Mark manages our Georgia location and is one of the owners of Miles Supply, Inc. See Facebook post. More of Mark giving out checks and a #TBT Throw back pic. Sonya wears many hats, one of which is HR. 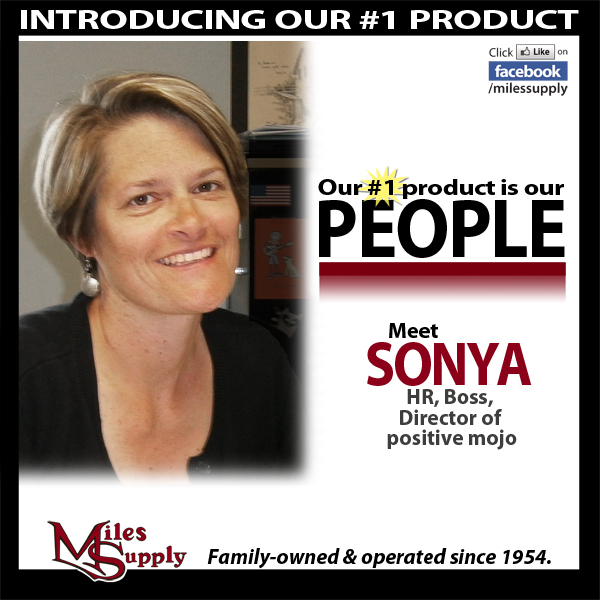 She is one of the owners of Miles Supply, Inc. Daughter of Charlie & Doris. See Facebook post on Golf outing and see Facebook post on Give Back program. Meet Sonya. 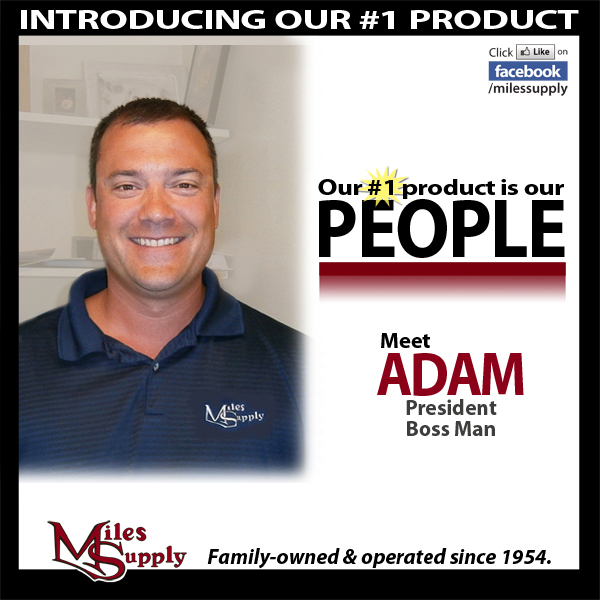 Adam is President and one of the owners of Miles Supply, Inc. son of Charlie & Doris Martin. He works in our Vermont location. Can you name our 7 staff in this picture? Another Show And a #TBT Throw back pic. Meet Adam. 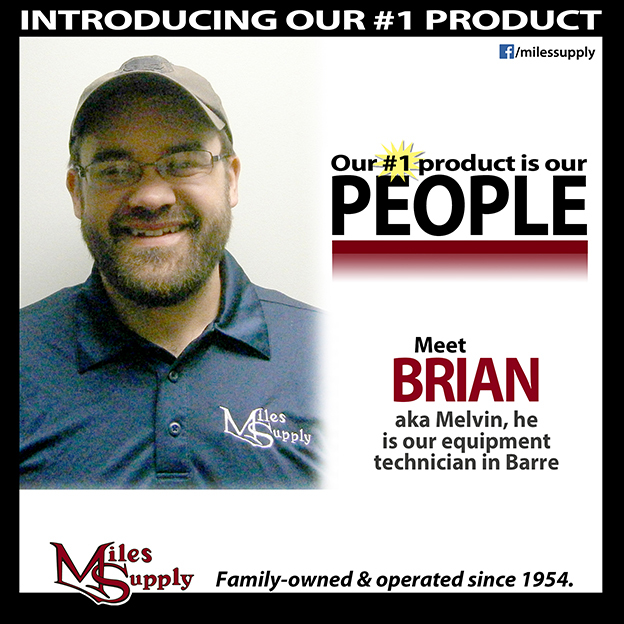 Brian is our helpful and accommodating Machine Equipment Technician. He doesn't always smell of solder. See Facebook post and see an install post, he took the pictures in this post. 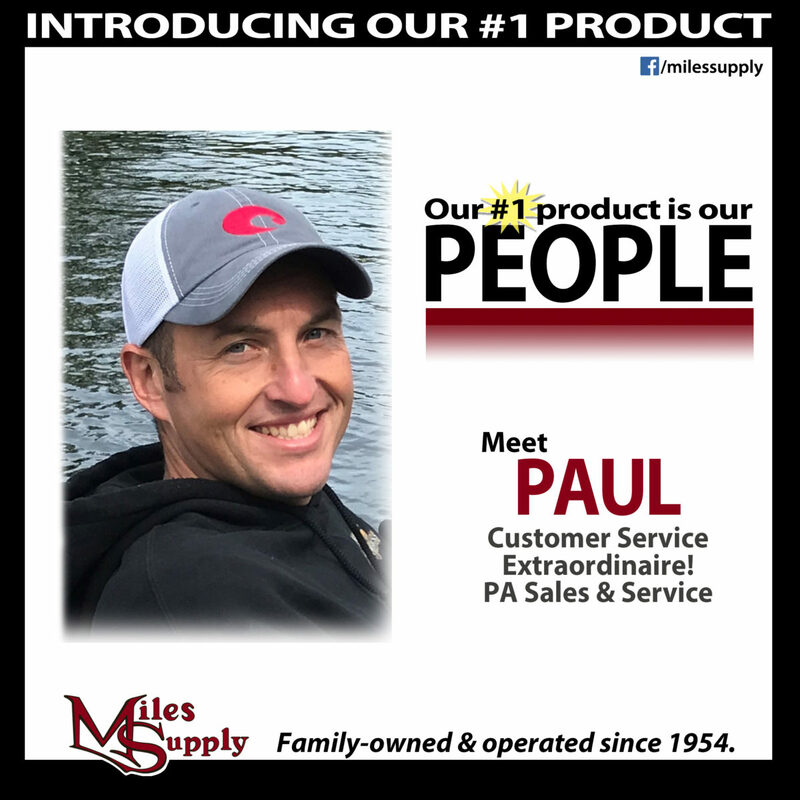 Paul has been with Miles Supply for 1.5 years in our Montrose PA location, selling diamond products and safety gear. His background with a bluestone quarry and being sales/service manager lends to his expertise of delivering high quality customer service. He’s lived in his hometown of Montrose all his life with his wife and two boys; ages 2 & 8. Marcia is in our VT location and has worked here for 2 years. She is our Accounts Payable Administrator. 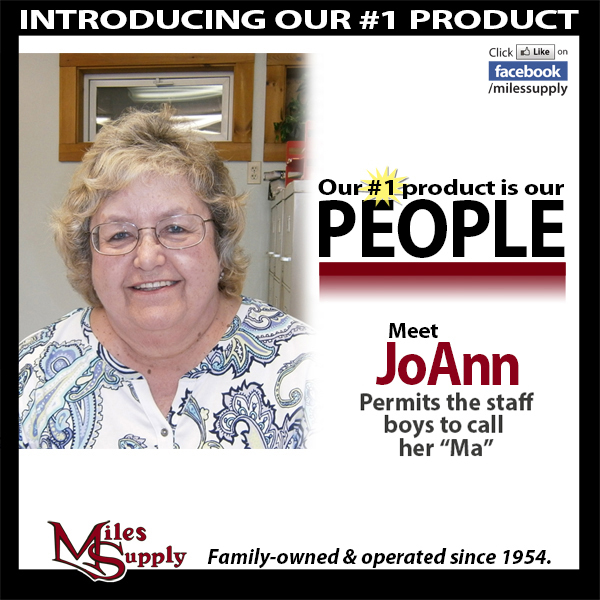 She comes to Miles Supply with 32 years’ experience from prior employment. Marcia is a Barre native, living and working in her hometown. 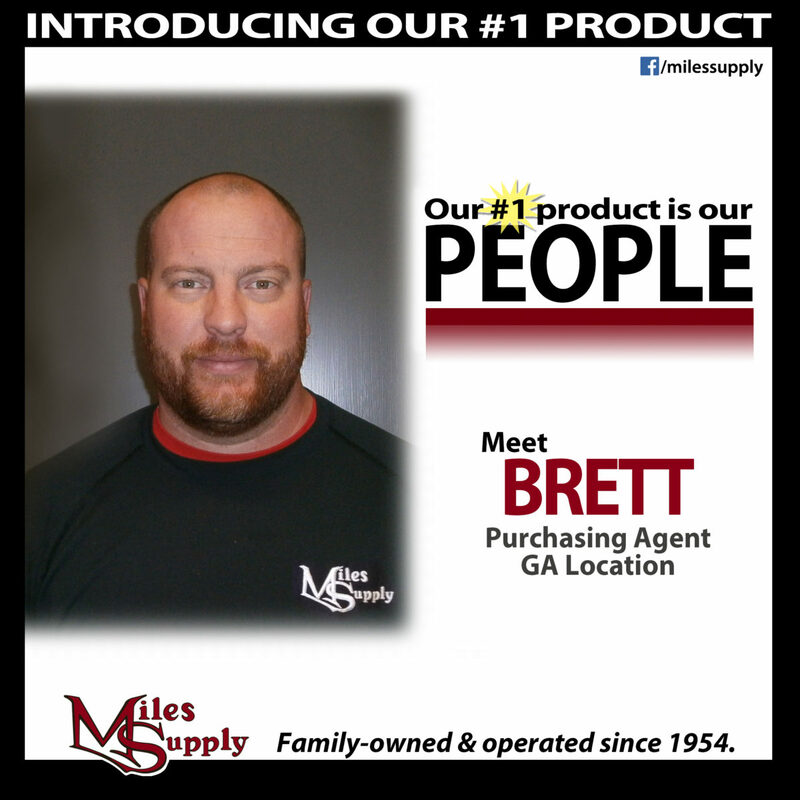 Brett works in our GA office, he is a Purchasing Agent. 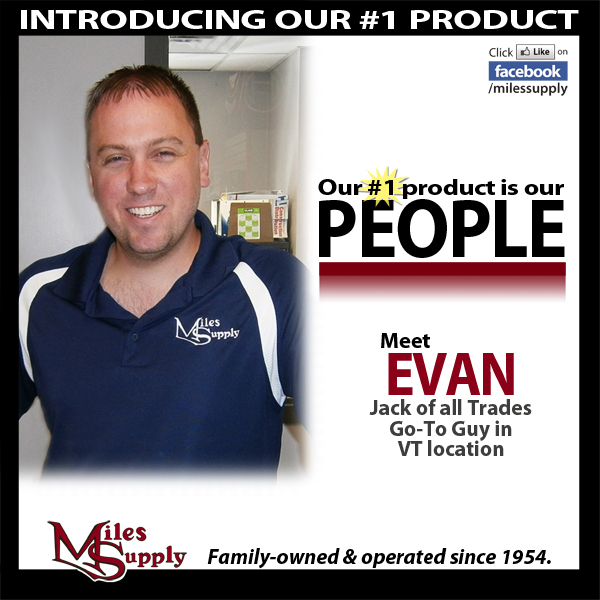 He has been with Miles Supply for 10 years. He lives in Elberton, with wife-Corrie, sons Cooper (6) and Brooks (1). Geoff, a Diamond Blade Tech and sales for 3.5 years, has been in the diamond blade market for around 8 years. 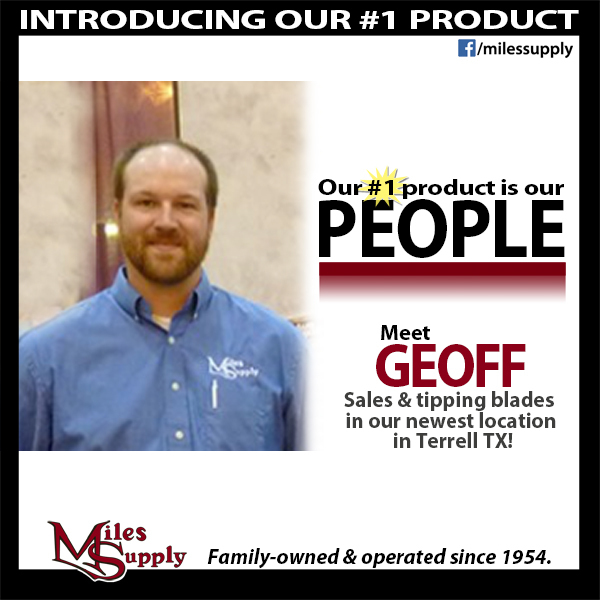 His expertise at Miles Supply is in blades and Lupato texturizing products. 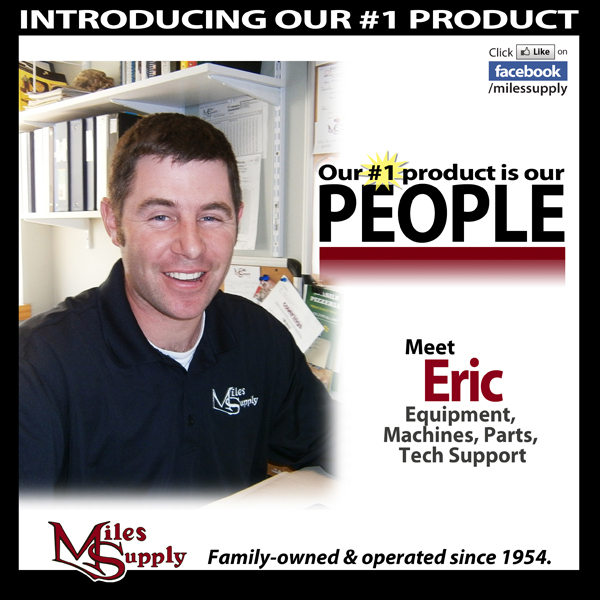 Geoff says his knowledge has continued to grow immensely since working for Miles Supply and he says "it's all because I enjoy what I do". 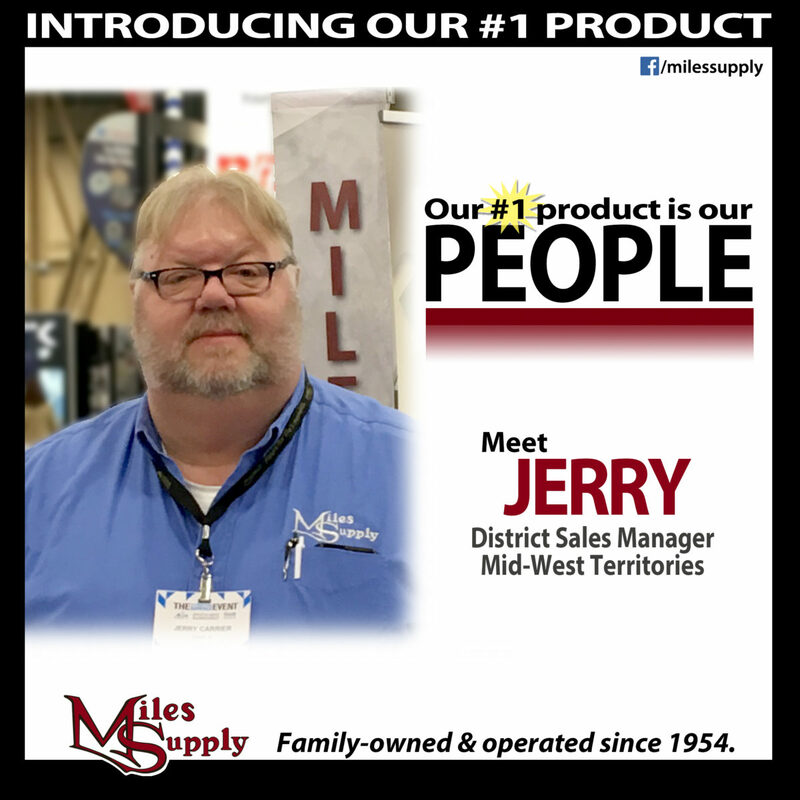 Jerry from IL is our Mid-West Territory sales manager. 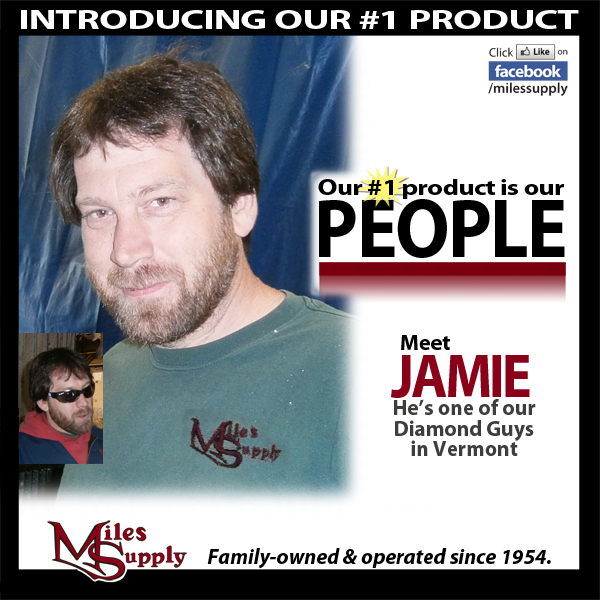 Selling diamond tooling and equipment, he's worked at Miles Supply for 1 year. "I have been a heavy equipment operator since I was 12 years old (or big enough to reach the pedals) I’ve been using repairing and modifying diamond tooling for the past 25 years in both the concrete cutting construction and the stone industry. Trained in the art of Hammer Smithing to repair large saw blades." Expertise in diamond blades, diamond wire, diamond tooling for CNC. Matching up the right tool to the saw and material and training on the use there of. "It has always been a pleasure to educate others with proper training and the use of diamond tooling, equipment function and material issues to investigate and solve problems." He lives in Utica, Illinois with wife, Kim, and The Mavis, their frenchie bulldog. 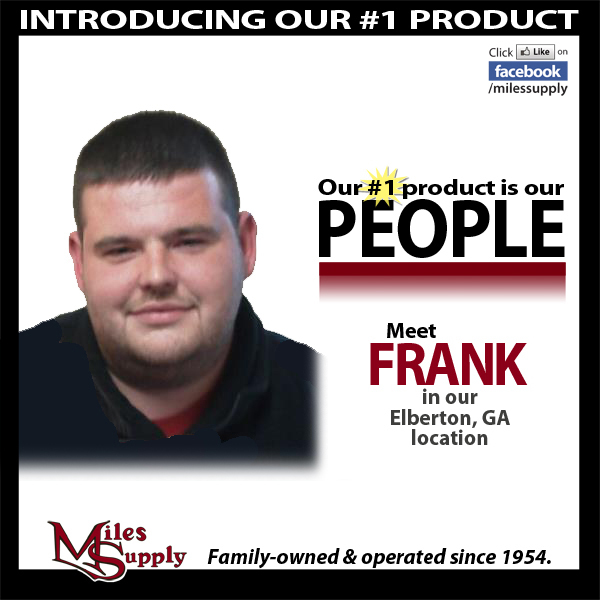 Reid is a Sales Representative in our Elberton, GA location. He's been with Miles for 1 year. 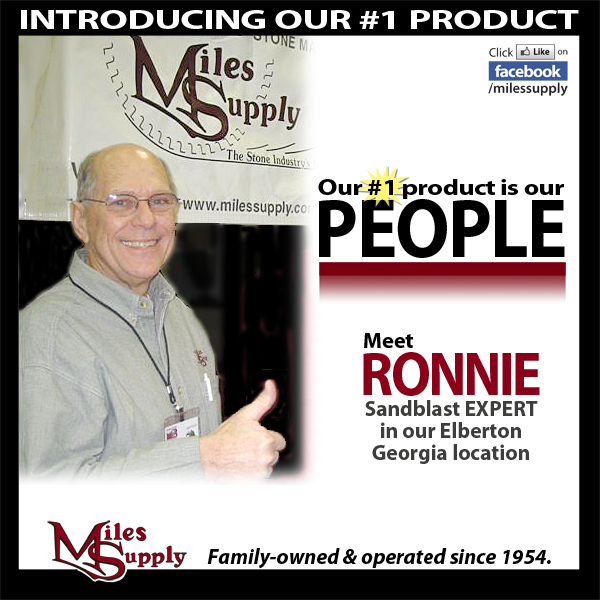 A native of Elberton, he does our general supply sales and also does wire testing for some of the wire saws in Elberton. When not at work, Reid is an avid Fly Fisher and spends any weekend he can in the mountain streams of North Georgia.